With some cars the value just keeps going up, investing some time and money into your NA or Auto Supra right now might pay off massively in the future. That was an easy decision for the owner of this beautiful Black MK4, currently tuned to over 500BHP. We decided that the best route in terms of conversion to go down was with CD009 gearbox from a 350z, it has the best ratio to work with the diff and a pretty decent price point to say the amount of power and torque it can handle. We paired this up with a Collins adaptor plate and a twin plate clutch and got all the interior bits we need from Toyota, to keep everything genuine and looking as spot on as possible inside the car. Obviously it was then over to the DK himself Jason Clark to get the new gear-shifter welded in place. And just like you would expect from our master fabricator he smashed it out of the park. Right now we’ve got the box in on a test fit and plan to get it bolted in place by the end of the day. 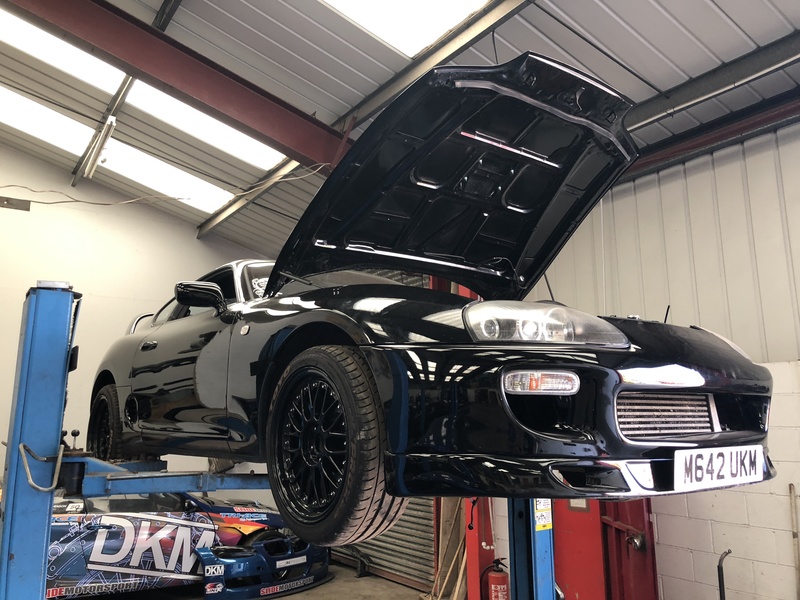 Keep watching this space for more on the conversion and some of the other bits we are going to be doing on this incredible machine, such as a new ECU, engine bay dress up and much more.